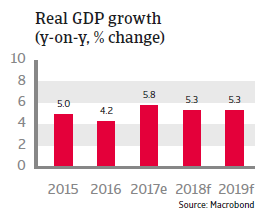 The economy shows high growth rates of more than 5% p.a., but high household debt could become an issue should interest rates increase substantially. The Barisan Nasional (BN) coalition led by the United Malays National Organisation (UMNO) has been in power since Malaya achieved independence in 1957. Despite growing electoral successes by opposition parties in the past, UMNO remains firmly in power, while currently the opposition appears to be weak and fractured. It is expected that the government will take advantage of this and call for an early dissolution of parliament and general elections to be held before the summer of 2018. Although the political future of Prime Minister Najib remains uncertain due to his involvement in the so-called MDB financial mismanagement scandal, even in case of his resignation the consequences for political stability would be limited. The Malaysian economy is well diversified, with agriculture accounting for 9% of GDP, manufacturing for 37% and the services sector for 54%. The country owns a considerable mining sector and is one of the 30 largest oil producers in the world. While oil reserves are declining, production of natural gas has continued to climb rapidly and reserves are still substantial. Oil and gas account for about 22% of total exports, while machinery & transport equipment account for about 46%. The export sector is a major economic strength, but at the same time the heavy dependence on external trade makes the country vulnerable to fluctuations in global prices for energy and electronics as well as to a slowdown in growth in China. 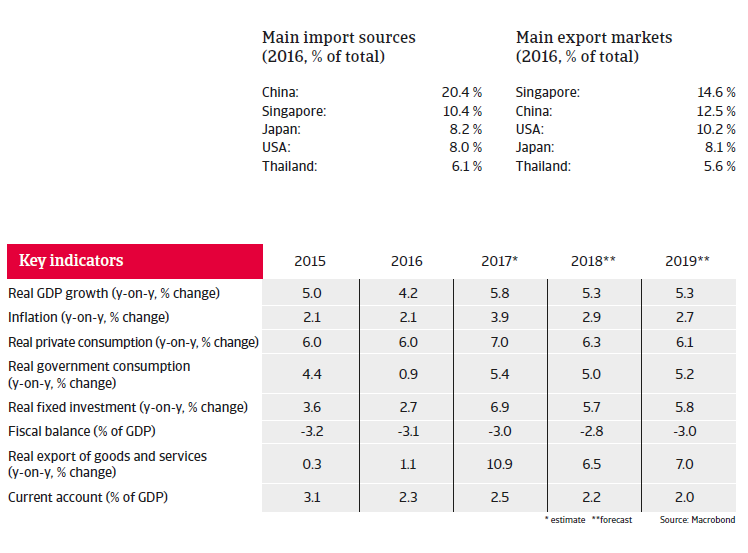 Malaysia´s economic growth is expected to slow down somewhat in 2018 to 5.3%, mainly due to lower external demand for electronics and electrical goods (the country’s largest export category). Consumer spending remains a key driver of growth, prompted by low unemployment and rising wages. The pick-up in private and government infrastructure investments seen in 2017 is set to continue, with a number of major projects expected to start in early 2018. 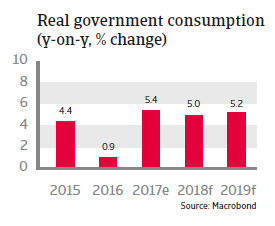 While inflation increased to almost 4% in 2017, mainly due to the scaling-back of subsidies, it is expected to decrease again in 2018, enabling the central bank to maintain an accommodative monetary policy. The government budget shows a constant annual deficit of about 3% of GDP, while public debt amounts to about 52% of GDP. High contingent liabilities due to commitments to state-owned companies and a rising share of debt held by non-residents are vulnerabilities. However, the stock of public debt is relatively lightly exposed to currency and financing risks, as more than 90% of it is denominated in ringgit and mainly held by local financial institutions. Despite high nominal GDP growth rates, foreign debt has increased over the past couple of years, from 58% of GDP in 2014 to 74% of GDP in 2017 (93% as a percentage of exports of goods and services). While those are still manageable levels, it makes Malaysia’s external debt vulnerable to volatility in foreign investor sentiment. Taking into account the flexible exchange rate, with more than five months of import cover, international reserves are still at an adequate level. The ringgit will probably depreciate against the USD in 2018 due to further US monetary tightening. Any sharp deterioration would increase the currency risk on company balance sheets, as the amount of corporate debt is considerable, with some of it denominated in USD. 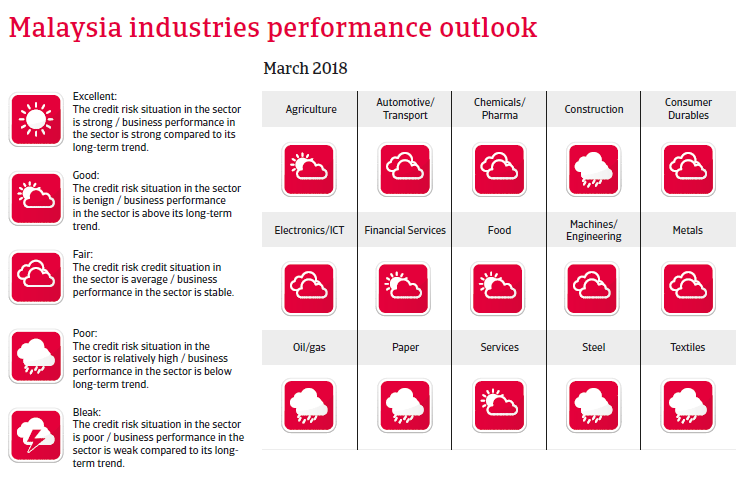 Malaysia has a well-developed financial sector, with well-capitalised banks, good credit quality and a low share of non-performing loans (about 1%). However, risk factors are the high level of household debt of about 87% of GDP and a high household income-to-debt ratio of 150%, which could become a problem if interest rates rise substantially. However, mitigating factors are the slowdown of credit growth and that private households have large financial buffers on average.